The shift by Theresa Brown. 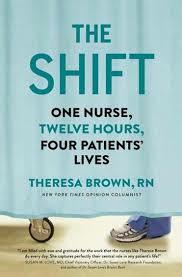 Brown is a “riveting account” of a day in the life of a highly competent and compassionate but overtaxed bedside nurse. Hunter Killer by Marl McCurley takes you inside the drone wars in this account by a former operator. Combat-Ready Kitchen by Anastacia Marx de Salcedo tells how military science influences the foods we eat. Unfinished Business by Anne-Marie Slaughter looks at the limits woman face in balancing the the demands of work and home. Read on for more on these gripping stories. This entry was posted in Non-fiction and tagged Food, Hospitals, Medical care, nursing. Bookmark the permalink.